Candida Albicans Yeast is an opportunistic microorganism that resides in the body, mainly in the digestive tract, especially the colon. In most people there is a yeast overgrowth due to conditions that are conducive to it. The reduction of friendly bacteria in the intestines, such as acidophilus and bifidus, has become widespread from use of antibiotics, chemical preservatives and alcohol, among other things. Carbohydrates, especially refined sugar, high fructose corn syrup and alcohol dramatically encourage yeast growth. In fact, it is common for yeast to spread beyond the intestines to other parts of the body. Birth control pills and other hormonal medicines can also encourage expansion of the yeast colony. With a lower level of "probiotic" protectors, candida yeast takes the opportunity to increase its presence. In some people it occasionally manifests a noticeable yeast or fungal infection. When it makes an appearance, that is likely to be just the tip of the iceberg. Yeast cells are like little toxin factories. As they emit their waste products, they toxify and irritate tissues. There are many common symptoms of candida yeast infection. A vaginal yeast problem is frequent among women who have taken antibiotics. If yeast symptoms such as itchiness and irritation are appearing there, yeast is probably active in other zones also. Due to the common knowledge of a vaginal yeast problem, yeast infection is usually thought of as a female issue. Other more serious female organ problems are often yeast related too. However, yeast overgrowth can be a factor in many health problems, and it is very common in men as well as in women. Yeast infection difficulties range from acne to sinus problems and allergies, to digestive disorders, to inflammation and arthritis; athlete's foot; nail fungus; rashes; and blood sugar problems like mental sluggishness, irritability, anxiety, headaches, etc. Further, yeast challenges and weakens the immune system, making one susceptible to colds, infections and illnesses. Ultimately, yeast overgrowth is at play as a causative or contributive factor in many major degenerative diseases, including: hypoglycemia, diabetes, hormonal problems, brain and nervous system problems, chronic fatigue, depression, anxiety, herpes, Multiple Sclerosis, Fibromyalgia, AIDS, cancer, arthritis and more. Yeast overgrowth diminishes availability of nutrients, especially magnesium. Good nutritional supplementation is needed. ~ consider our basic "Yeast Control Kit"
Candida Albicans yeast and the many problems it fosters can be checked, with a return to good health and a pleasant life. However, the battle is not easy. Candida overgrowth drives a desire for the sweets it thrives on. It uses up blood sugar, generating hypoglycemic symptoms such as tiredness, fogginess, grogginess and anxiety. Yeast also burns up magnesium, one of our most important minerals needed for energy production, calmness, muscles, nerves, good sleep and more. More serious health problems including glandular and hormonal problems, digestive and intestinal problems, urinary system problems, immune system problems, and much more, are often yeast related. Candida yeast overgrowth is an underlying factor in almost every serious health crisis people have, from sinus drainage to allergies to cancer. A yeast control diet of low carbohydrates is essential for success against yeast overgrowth. If you feed the yeast it multiplies itself and increases waste production, which also can cause greater symptoms. Avoidance of foods with components fermented with molds, such as vinegar and alcohol, is also important. These have been known to activate or even feed the internal yeast colony, sometimes triggering a reaction that stresses the immune system. On the other hand, as the yeast is eliminated, a "die-off reaction" may result, which is a temporary increase in toxins in the system from the dying and deteriorating yeast cells. An increase in symptoms and ill feeling may result. You can adjust the pace of your yeast management process with the amount of supplements for yeast control you take per day. You can and should be healthy. This takes time, a willingness to learn and a dedication to action. It is critical to move from the degenerative direction to the path of natural health and well being. No matter where you are in the spectrum of health, improvement can be yours if you do what needs to be done. You will be very glad you have chosen to help yourself, if you are already having noticeable problems. If you have even at this point even a slight yeast issue, it would be wise to take steps to prevent what could become very serious unpleasant problems. A healthy body is host to a delicate balance of yeasts and friendly micro-flora. That balance is affected by poor diet and certain other factors, which can influence the immune, digestive and urinary systems. 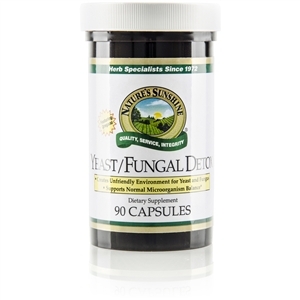 Yeast/Fungal Detox helps the body detoxify itself and promotes optimal balance in micro-flora levels. This formula helps maintain the balance of microorganisms and supports the immune, digestive and urinary systems to promote optimal health. Yeast/Fungal Detox contains caprylic acid, propionic acid, sorbic acid, Echinacea angustifolia root, oregano, garlic, pau d’arco, selenium and zinc. Adults: Take one capsule three times daily with a meal. 1 bottle "Silver Shield" effective silver supplement, 6 oz. to order "Yeast Control Kit"